I have a friend called Fanny. Her sister, Agnes, is married to a guy named Leo. Leo once had dreadlocks. 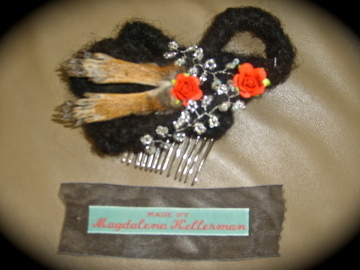 When he cut these off, Fanny's and Agnes' mother, Magdalena Kellerman, saved these locks and made a hat/fascinator. This little work of art is now mine! It's fitted with a comb underneath to make it easy to slip into my hair. As you can see it has little roses and pearl flowers attached to it - and a pair of taxidermied squirrel legs. I know, this might seem a bit morbid. But that's one of the reasons why I really like this little fascinator - the morbidity of the legs from a dead animal coupled with the dainty flowers and pearls. I love when you put opposites together like that! I bought it at Kellerman Vintage, and if you want one too, I can tell you that there is one left in the shop. It looks a little bit different though. It doesn't have the red roses, but a beautiful brooch in the middle instead. And the legs on that one is a pair from a little bird. This one is fitted with a brooch needle in the back. But if you want to use it as a fascinator, it can easily be fastened with a few hair pins. Or, a comb could be sewn onto the back of it.